BarCampNorthEast – Page 2 – An ad-hoc gathering born from the desire for people to share and learn in an open environment. 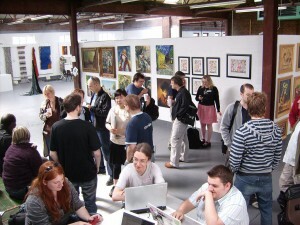 A BarCamp is an ad-hoc gathering of people to share and learn in an open environment. It is not so much a conference as it is an “unconference”. BarCampNortEast5 was held in Newcastle upon Tyne on the 21st and 22nd July 2018 and it was great. At a BarCamp there are many interesting session being run from the latest bleeding edge technology, through social discussions, wine tasting, show and tell, to how to make the perfect cup of tea, and most things in between. The two days are split in to many sessions across several rooms and there are many options to choose from. The only payment you need to attend these great sessions is to participate. You do not have to do a full presentation (although it would be great if you can) but you are expected to participate and contribute. It can be a bit “geeky” at times, but it is not a geeky event, and you do not have to be a geek to attend. As the name would suggest BarCampNorthEast5 is our fifth BarCamp in the North East and has been dubbed the most friendly BarCamp in the UK. More information about BarCamps is available on the BarCamp wiki and on Wikipedia.